The Antamina, copper-zinc-silver-molybdenum porphyry/skarn deposit is located in the western Cordillera of central Peru, 270 km north of Lima and 130 km east of the Pacific Ocean. (#Location: 9° 32' 16"S, 77° 03' 36"W). 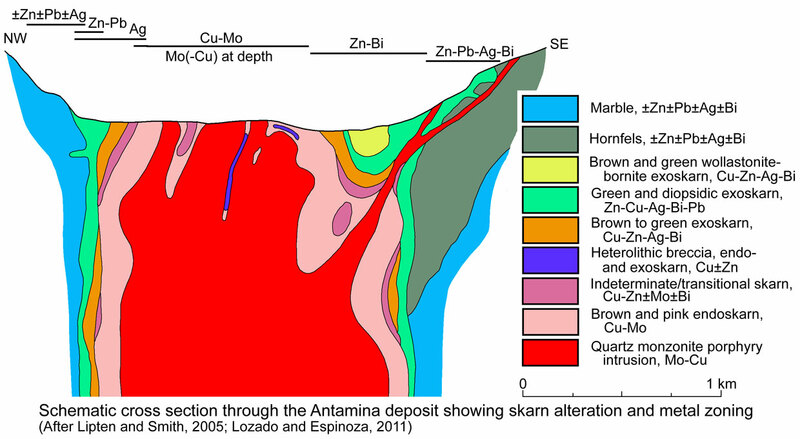 The Antamina deposit is hosted by calcic skarn alteration, related to a low grade to sub-economic Miocene calc-alkaline porphyry copper-molybdenum mineralised intrusion. The orebody comprises an oxidised, garnet rich skarn alteration zone with a garnet-pyroxene chemistry typical of copper related 'skarns', although the outer zinc rich zone has grades well above those normally expected from the low grade sphalerite bearing periphery of such copper/skarn systems. Antamina lies within the Incaic thrust and fold belt in the eastern part of the Cordillera Occidental, hosted by rocks of a Mesozoic carbonate rich shelf sequence that is bounded to the east by the Marañón Arch. This arch is occupied by a complex of Proterozoic to Lower and mid-Palaeozoic gneisses, schists and magmatic rocks that form the core of the Cordillera Oriental. The host sedimentary rocks were deposited in an ensialic, extensional, back arc basin, related to an inferred east dipping subduction zone to the west. The basin was closed in the mid Cretaceous and the Coastal Batholith intruded into what is now the Cordillera Occidental in the late Cretaceous to Paleocene, and was deformed during the Late Eocene. During the late Tertiary the region was covered by sub-aerial volcanic rocks and intruded by a series of small high level Miocene stocks, followed by the late Miocene Cordillera Blanca Batholith which is to the west of Antamina. The porphyry related ore deposits of the Cordillera Occidental are related to this Miocene magmatism. For a detailed description of the tectonic, geologic and metallogenic setting of the Antamina deposit, see the separate Peruvian Andes record. Antamina is located within one of the widest sections of the Incaic Fold and Thrust belt, where it has a width of about 40 km. The structures and stratigraphy trend NW-SE and the thrusts are east verging, with tectonic activity having taken place during the late Eocene Incaic II stage. The deposit is hosted near the Incaic structural contact between the 200 to 800 m thick Jumasha and 115 to 225 m thick Celendin Formations, with ~75% of the known exoskarn replacing the former. The Jumasha Formation, which is mid to upper Cretaceous (Albian) in age, is thrust over the younger Upper Cretaceous (Coniacian) Celendin Formation in a number of sections. The Jumasha forms prominent steep mountains of massive to thick-bedded, relatively pure light grey limestones. The Celendin Formation is markedly more shaly and comprises thin-bedded, predominantly marly limestones (Love et al., 2004). West of Antamina the Jumasha Formation forms a steep thrust ramp over itself and the Celendin Formation. Further west, successive thrusts transport the stratigraphically lower Pariahuanca Formation over the Jumasha (the Chulec and Pariatambo Formations are missing), the Carhuaz and then the Lower Cretaceous Chimú Formation (Lipten et al., 2005). The Antamina deposit lies within the NE-SW trending Querococha arch which defines a cross-strike structural discontinuity in the segmented Incaic Marañón thrust and fold belt. This arch has been active from at least the Jurassic when it formed a basement high and has subsequently influenced structural trends of fold axes, faults and thrusts (Love et al., 2004). The ore deposit lies within the Antamina valley, which is a 4 km long, steep sided, U-shaped glacial feature with a flat floor 500 to 600 m below the enclosing ridges, and a corrie lake in an upper valley at it's head. The lake surface was at 4337 m, while the lake itself, which covers section of the deposit, was 760 m long by 510 m wide and up to 51 m deep underlain by up to 45 m of lake sediments. The mineralisation at Antamina is associated with a composite quartz-monzonite porphyry intrusion that can be divided into: i). crowded plagioclase porphyry, which comprises the main mass of the un-skarn altered porphyry; ii). crowded plagioclase K feldspar porphyry, iii). crowded plagioclase K feldspar megacrystic porphyry, and iv). sparsely porphyritic plagioclase K feldspar porphyry. A minor intrusive, comprising a sparse hornblende plagioclase porphyry, forms a dyke in the NE end of the Antamina valley (Lipten et al., 2005). The contact relationships among the different porphyry phases are not clear, although, in general, the crowded plagioclase porphyry is the earliest phase, and the sparse porphyry, the latest. Locally, the crowded-porphyries contains quartz vein stockworks and associated potassic alteration in the form of biotite. This altered but un-skarned porphyry, locally hosts disseminated and vein molybdenite mineralisation and minor disseminated chalcopyrite, comprising ≤0.2% Cu and 0.03% Mo. In general, the porphyry Mo mineralisation appears to be overprinted by skarn alteration. Sparsely porphyritic dykes cut crowded porphyry, skarn and breccia, and locally contain skarn xenoliths. Cu mineralisation is absent from significant sections of the prograde, coarse-grained endoskarn, almost entirely occurring as vein-controlled sulphides, accompanying retrograde skarn alteration. Phyllic alteration in the porphyry is rare and may be proxied for by the retrograde endoskarn alteration (Lipten et al., 2005). Although multiple intrusions and phases are recognised, they were probably all intruded within <1 m.y., and are statistically identical in radiometric dating with a mean of 9.8 Ma (9.1±0.4 Ma to 10.4±0.4 Ma, where n=5; K-Ar; USGS 1970's, quoted by Lipten et al., 2005; McKee et al., 1979), with no significant differences between primary biotite, primary K feldspar and secondary K feldspar, nor between different intrusive phases. The intrusions comprises a main, composite, almost circular, slightly NNE-elongated stock, that below its roof, is ~800 x 750 m. The roof of the stock was preserved and prior to mining was overlain by skarn below the lake sediments. At this upper level, near and above the roof, there was strong structural control, and the porphyry had intruded along multiple structures, often as narrow bodies that are small and discontinuous. At these upper levels, the composite stock splits into several discrete broad dykes with a dominant NE trend, but also locally SE and east-west trending. Dips of these intrusive elements vary from vertical to moderate (~45°), but tend to converge into a consolidated stock at depths of around 100 m below the surface. A NE-trending intrusive spur occurs to the NE, and a SW trending spur at the SW end of the main intrusion. With these and other satellite bodies, the intrusive complex extends over a length of 1700 m with little variation in the shape downward in the upper levels. There are also separate surrounding smaller intrusions with associated skarn alteration. The main trend of the intrusive bodies, dykes and phases is NNE to NE, although there are also east-west and NW trends. Skarn developments surrounding and overlying these individual intrusions and the main stock have widths varying from 70 to as much as 800 m in the upper level, but generally form a 300 to 400 m wide shell (Lipten et al., 2005). Other similar age and sized intrusions and skarn developments are known in the surrounding district, although now have the same large skarn or grade seen at Antamina. The key factors in the development and preservation of a large skarn orebody at Antamina are good structural preparation of the country rock prior to intrusion, and preservation of the roof zone of the intrusion and overlying flat skarn bodies as well as steep skarn bodies at the sides of the intrusion (Lipten et al., 2005). The limestone/marble country rocks on the margins of the skarn alteration envelope are generally light grey, very fine grained and micritic, with parallel bedding on a scale of several centimetres, but contains no fossils, shell fragments or other biogenic or sedimentary structures. In the upper valley slopes, these carbonates are thickly bedded (1 to 3 m) and light grey, and in cliff faces, weather to a white or creamy colour, and are classified as micrites. These are interpreted to belong to the Jumasha Formation, that is anomalously thick at Antamina, as a result of structural thrust thickening. At the head of the Antamina valley, to the NE of the deposit, there are interbedded (2 to 3 m beds) micritic and stromatolitic limestones. In the anticlinal core, on the western side of the deposit, dark grey to black limestones are both exposed and intersected in drill core. These have centimetric scale wavy bedding (bioturbated or slumped), are shelly and typically have bands of black chert nodules, and belongs to the older Pariatambo Formation. In the anticline on the eastern side of the valley, limestones form a light grey core, followed by a unit of black limestone with thin grey beds, then a light grey micritic limestone. These are distinct from the overthrust beds that are typical of the Jumasha Formation (Lipten et al., 2005). The Antamina deposit comprises two areas of mineable mineralisation, the Antamina Main Deposit and Usu Pallares. The latter comprises the separated intrusion and skarn development on the southwestern part of the deposit. The two areas are very similar in geology and lithological zoning, although the style of mineralisation may vary in size and extension. Limited information suggests that both were formed contemporaneously, and are likely physically connected as part of the same mineralising system (Lozada and Espinoza, 2011). Most of the skarn developed at Antamina is exo-skarn, dominated by massive garnet. 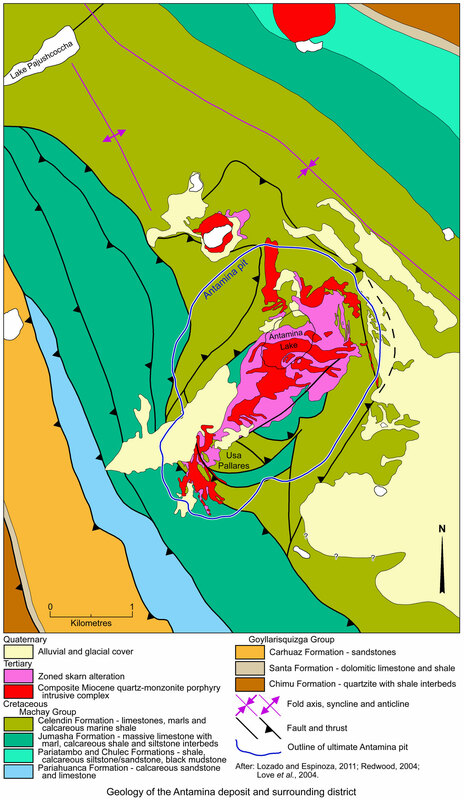 The skarn alteration halo is concentrically zoned from brown, out to green garnet, then to 'marbleised' limestone, with localised wollastonite (CaSiO3) and diopside (CaMgSi2O6) zones on the outer margin of the skarn. Metals are also zoned, with Cu in the inner brown garnet and Cu-Zn in the outer green. Over 90% of the skarn is mineralised containing significant amounts of Cu with subordinate Zn, Ag & Mo. Higher grade Cu occurs with red-brown garnet in endo-skarns. Zinc averages around 0.2% in the brown garnet zone (which is not recoverable) but is generally over 2% in the outer green garnet zone. Endoskarn is recognised as garnets pseudomorphing a porphyry igneous textures, and the presence of porphyry relics. The inner margin of endoskarn development is gradational, with the selective replacement of plagioclase and groundmass minerals. The outer contact of the porphyry tends to be a hybrid plagioclase-rich monzonite, with abundant xenoliths of marble and garnetite. Endoskarns are most abundant in the roof of the porphyry stock, where the stock comprises numerous narrow dykes in limestone with pervasive garnet replacing limestone and pervasive to partial garnet development in the porphyry. In general the endoskarns are only a minor part of the system, being restricted to the outer few metres of individual intrusions (Redwood, 2004). • a coarse-grained pink garnet bearing variety, composed of a milky-white plagioclase-rich matrix, which contrasts with the pale-grey, translucent matrix of un-altered porphyry. The matrix in this variety encloses large pink, and sparse maroon garnets, and has a relict porphyritic texture. Significant mineralisation is not apparently paragenetically associated with the development of this coarse-grained endoskarn, which, commonly contains disseminated molybdenite, only rarely hosts blebs and/or veinlets of chalcopyrite associated with epidote. It becomes an ore-host where later sulphide veins are developed that are accompanied by retrograde alteration, and locally comprise sheeted arrays. Narrow zones of plagioclase endoskarn are commonly found between the unaltered porphyry and coarse-grained pink-garnet endoskarn, and rarely contains ore-grade Cu, and entirely lacks Zn, but is a useful indicator of proximity to ore (Lipten et al., 2005). • a fine-grained dark pink garnet variety, commonly hosting crackle or mosaic breccia and constituting many of the fragments in heterolithic breccia bodies that cut intrusive rock. This variety is distinguished by its colour, grain-size, mineralogy and relict porphyritic textures. It is interpreted to possibly have formed either through interaction of the porphyry with brecciating fluids, or in structures that later focussed or controlled brecciation (Lipten et al., 2005). Disseminated and veined, porphyry-style Mo mineralisation is overprinted by endoskarn, and the veins are rendered indistinct through quartz being consumed by the skarn development process. The bulk of the endoskarn hosted Cu mineralisation postdates Mo, and consists of pyrite-chalcopyrite (±magnetite) veins, and is associated with retrograde alteration (Lipten et al., 2005). This skarn type is interpreted to represent a transition between exo- and endoskarn, where skarn generation was intense, and both endoskarn and exoskarn approached the same composition and mineralogy, and the two facies became indistinguishable. It commonly has a variable texture, grain-size and colour, but in general, is brown, medium-grained and granular. Granular, medium-grained, brown garnet skarn with intergranular chalcopyrite can be recognised as the inner part of brown garnet exoskarn where it constitutes the end-member of a continuous gradation from green garnet exoskarn. Similarly, fine-grained, dark-pink garnet skarn with veins that have chloritic selvages but lack relict porphyritic texture would be recognised as the outer zone of an endoskarn if it were in gradational contact with porphyry. However, a wide variety of the different variations occur and these types of zonation are not evident, and when this is the case, or there is ambiguity, the unit is classified as indeterminate skarn (Lipten et al., 2005). • Brown Garnet Exoskarn is relatively rare, and is texturally identical to, and grades in colour into, green garnet exoskarn. It apparently forms the innermost zone of exoskarn, separating an inner annulus of endoskarn, that fringes a relatively unaltered porphyry core, and an outer shell of green garnet exoskarn, and locally, wollastonite skarn. It may also grade inward into brown indeterminate skarn (Lipten et al., 2005). There is no sharp contact between the brown and green garnet exoskarns, but a colour gradation. Both are massive garnetites, predominantly composed of andradite [grossularite - Ca3Al2(SiO4)3 - 0 to 28%; andradite - Ca3Fe2(SiO4)3 - 72 to 100%], zoned from grossular-rich cores to andradite-rich rims. Some of the green garnet skarns contain minor diopside also. Texturally they vary from fine (<1 mm) to coarse (>10 mm) and from massive and hard to vuggy, with euhedral crystals. The brown garnet zone, to the SE, is a massive, fine grained garnetite, which is hard, composed of microgranular aggregates of garnet, diopside and wollastonite cut by sheeted quartz veinlets with low metal values. Medium grained garnetite is commonly disaggregated, apparently due to dissolution of minor interstitial during hydrothermal activity. The porosity of the garnetite is explained by volume reduction during the formation of garnet after limestone, leaving vugs that facilitate ingress of mineralised hydrothermal fluids (Redwood, 2004). • Green Garnet Exoskarn which constitutes much of the deposit, occurring adjacent to marble or hornfels. Green garnet exoskarn has been interpreted to have formed by two different reaction paths in different parts of the deposit, namely, a). via wollastonite skarn, and b). direct replacement of calcite, with no evidence of an intermediate wollastonite phase. The two types are texturally indistinguishable. Green garnet skarn contains either chalcopyrite-sphalerite ore or sphalerite alone, with the sulphides ranging from disseminated to massive and interbanded with green garnet. Sphalerite typically averages 3 to 5% in green-garnet exoskarn. However, it is erratically distributed, commonly occurring as rich bands separated by relatively barren sections (Lipten et al., 2005). • Magnetite Exoskarn zones, up to several metres across, are found within the garnet skarn. The magnetite is interpreted ot be relatively early, and is cut by chalcopyrite veinlets. It also occurs as pseudomorphs after hematite crystals (Redwood, 2004). • Wollastonite Exoskarn, which does not occur as a consistent continuous zone, being best developed in the central southeastern margin of the deposit. It comprises white, fibrous wollastonite with diopside and coarse-grained pink and green garnet. The diopside occurs as large (up to 20 mm), circular crystals with radial texture, cross fractures, and a dull brown-green color (Redwood, 2004). Where developed, this exoskarn has an inner fringe (contiguous with green garnet skarn) characterised by the presence of bornite, and an outer margin (closer to marble) containing bornite-sphalerite. The inner contact with the green garnet skarn is a broad gradational zone where green garnet replaces wollastonite, and is known as 'wollastonite-green garnet skarn'. Ore contains bornite throughout this transition, from the wollastonite exoskarn into the adjacent green garnet zone. The contact between bornite and chalcopyrite in this interval is similarly gradational, where chalcopyrite and bornite co-exist, generally within the bordering green garnet skarn. Zones of wollastonite-brown garnet skarn are also known (as both endoskarn and exoskarn) with bornite, although this skarn unit is far less abundant than the wollastonite-green garnet skarn unit (Lipten et al., 2005). Retrograde alteration products in the endoskarn section include vesuvianite, calcite, quartz and steatite, with apatite, fluorite, muscovite, ilvaite, epidote (allanite), cordierite and sphene also sporadically developed (Redwood, 2004). According to Redwood (2004), the bornite associated with the wollastonite exoskarn was paragenetically late following the main prograde skarn formation and occurs together with trace chalcopyrite in interstitial sites and quartz veinlets. Geochemically this marginal zone is enhanced in both gold and bismuth. Wollastonite also occurs in the comminuted matrix to the phreatic hydrothermal breccia. This type of breccia is distinguished by the absence of magnetite (Lipten et al., 2005). • Diopside Exoskarn, which forms the outermost exoskarn, and is predominantly located on the northern and eastern flanks of the deposit, where it comprises of a pale green diopside with calcite, quartz and wollastonite. It is generally only weakly mineralised, occasionally reaching levels sufficient to be considered ore grade and is the outer most skarn lithology related to the hydrothermal event that formed the Antamina deposit (Lipten et al., 2005). Hornfels occurs as a fine-grained rock which can be pale-brown, pale-green, grey, khaki or yellowish-grey, and varies from fine-grained to aphanitic, and ranges from massive to laminated, with fine, wavy, compositional banding, and generally consists of a very fine-grained aggregate of garnet, phlogopite and diopside with minor wollastonite. It is locally present at or near the margins of the deposit, and has no apparent porosity or permeability, and appear to be un-reactive, only containing rare, minor sulphides and almost never reaches ore grade. These rocks normally define an outer limit to mineralisation. They are thought to be of thermal metamorphic origin as opposed to the diopside skarn, which is of metasomatic origin (Lipten et al., 2005). Hydrothermal phreatic breccia, which lacks juvenile components, is widespread and an important ore host. These breccias cut all skarn types, including wollastonite varieties, but is particularly common at the endoskarn-exoskarn contact, which marks the original margins of the stock, and along features of suspected structural weakness within the deposit. These breccias are intra-mineral, as they are observed to cut and enclose clasts of mineralised skarn, yet themselves host replacement-style and vein mineralisation of pyrite-chalcopyrite-magnetite-sphalerite. Both the breccias and the veins in endoskarn contain a similar association of metallic minerals, although magnetite is a very minor component of veins in the latter. These breccias were initiated in the late prograde skarn development and continued episodically through the retrograde phase, controlling the most intense (but still minor) retrograde alteration. • Crackle breccia, dominated by angular fragments of the immediate host rock that do not appear to have been rotated or transported, but are cut by an irregular network of narrow breccia veins. • Mosaic breccia, which is gradational between crackle and heterolithic breccia and consists of angular fragments of the host rock, with some rotation and/or transport of clasts, set in a matrix of finely comminuted material with or without sulphide grains. • Heterolithic breccia is frequently matrix-supported containing angular to subrounded fragments of all of the rocks and minerals it cuts, as well as clasts of sulphides, magnetite and quartz, which appear to be derived from veins and replacement selvages restricted to the breccias. The breccia matrix ranges from massive to laminated, and the clasts range from randomly oriented to locally shingled or imbricated. Heterolithic and mosaic breccias generally contain above average Cu and Ag ore-grades, and locally carry ore-grades of Mo and/or Zn inherited from the wall rocks. Breccias may also locally contain galena. Complex retrograde skarn alteration have been recognised within the endoskarn and some of the indeterminate skarns, and is is valiably developed outward from veinlet selvages, stockworks and breccias, and as a pervasive replacement. In the latter, the retrograde alteration is referred to as 'chlorite skarn', which is typically disaggregated. The retrograde alteration commonly takes the form of hydrothermal breccias in which clasts of garnetite and vein qualtz occur in a matrix of retrograde minerals, including sulphides. These breccias contain clasts that are angular to subrounded with little displacement, but no exotic clasts. Brecciation is controlled by steep fractures (Redwood, 2004). Vein and stockwork mineralisation associated with retrograde alteration range from epidote or chlorite selvages to chalcopyrite-pyrite blebs and veinlets, to chlorite associated with pyrite-chalcopyrite (±magnetite) veins within crackle and mosaic breccias. This alteration is characterised by chlorite, epidote, actinolite, quartz, calcite, sericite and clay and is fracture controlled, found both as selvages and a breccia matrix replacement. Although volumetrically only representing a small portion of the Antamina skarn, retrograde alteration is widespread and commonly associated with mineralisation, but is limited to structural zones (Lipten et al., 2005). Retrograde alteration does not affect the exoskarn (Lipten et al., 2005). There is only minor phyllic and argillic alteration within the intrusives. The retrograde garnet skarn has been subjected to only relatively minor retrograde alteration which is fracture controlled and pervasive (chlorite rich). Large vertical hydrothermal breccia bodies which were initiated in the late prograde skarn development and continued episodically through the retrograde phase control the most intense (but still minor) retrograde alteration. This alteration is characterised by chlorite, epidote, actinolite, quartz, calcite, sericite and clay (Lipten et al., 2005). Irregular zones of disaggregated skarn, distinct from breccia, occur in green and brown exoskarns around the margins of the deposit and appear to be stratigraphically controlled in many places (Lipten et al., 2005). Beyond the skarn, the marble altered limestone contains mantos of skarn and veins (Redwood, 2004). An important feature at Antamina is that the main intrusion has not been unroofed, with only dykes and sills outcropping, and a cap of preserved mineralised skarn separating the roof of the main intrusion from the surface. The Mo(-Cu) bearing intrusive core is surrounded by a broad Cu-zone and an outer Zn-rich green garnet zone that is narrow at depth, but expands in width upwards, suggesting it originally wrapped over the roof of the intrusive complex. The sulphides, which are interstitial to the garnet crystals, are coarse and easy to separate, with low total iron sulphide. Pyrite and magnetite are ubiquitous, while pyrrhotite is rare. Chalcopyrite is the dominant copper sulphide, while zinc is present as sphalerite. In the low iron wollastonite zone however, bornite dominates. Molybdenite occurs in the early and middle intrusives, while silver is found throughout, being mainly in the chalcopyrite, although higher levels in the outer zones are associated with galena. Massive sulphides occur on the skarn-limestone contact. • retrograde stage, where sulphides, dominantly pyrite and chalcopyrite, are a major component and mineralisation is accompanied by retrograde skarn alteration (Redwood, 2004). The principal sulphide minerals are chalcopyrite and pyrite, with sphalerite in the outer zinc zone, as well as local pyrrhotite. v). a peripheral silver-Iead-zinc zone. Silver is present in any of the skarn lithologies, whilst lead is generally located in green garnet exoskarn, diopside exoskarn and hornfels. This lateral zoning is closely related to the orientation of the intrusive and limestone contacts and continues throughout the nearly one kilometre of vertical range of the deposit. • Chalcopyrite-rich mineralisation, which is distributed throughout the garnet endoskarn and exoskarn occurring as the main copper-rich zone, coinciding with the proximal brown garnet (endo- and exoskarn), overlapping into the copper-zinc zone within the more distal green garnet exoskarn. Copper grades are similar in both intervals. In the upper levels of the deposit, the copper-only zone has a width of as much as 600 m, decreasing at depth to be only 100 to 350 m wide. A high-grade (>2%) copper zone occurs beneath the eastern side of the Lake zone from surface to a depth of ~300 m, with intersections that include 120 m @ 4.72% Cu and 268 m @ 3.30% Cu. Chalcopyrite was formed during early stage mineralisation as interstitial, veinlet and massive zones in garnetite, whilst appreciable amounts were also introduced during the retrograde stage in the 'chlorite skarn'. Chalcopyrite also occurs in the stock as porphyry-type mineralisation in veinlet and disseminated form, but in sub-economic quantities. • Bornite-rich mineralisation is principally restricted to the wollastonite skarn and locally in the adjacent outer sections of the green garnet skarn, mainly in the central southeastern sections of the deposit, where it occurs over a strike length of ~400 m and widths of up to 160 m. Bornite is only found in the higher levels of the deposit, with the base of its development deepening to the SW. On the western side of the deposit, bornite locally occurs in narrow zones of up to 30 m in wollastonite and green garnet skarns, both at the marble contact and in the marble itself. In the southern sections, bornite zones are present in both the eastern and western contact zones. • Sphalerite-rich mineralisation is found in the outer sections of the deposit, approximately coincident with the green garnet and wollastonite skarns. In this interval, sphalerite accompanies chalcopyrite to form a copper-zinc halo, defined by the >0.5% Zn contour which represents a natural statistical break in grade. Copper grades are unchanged from those in the contiguous copper-only zone. General the copper-zinc halo is wider in the upper parts of the deposit, typically 100 to 200 m, decreasing with depth, where it averages 20 to 50 m, although it may expand to as much as 350 m along structures. The sphalerite zone probably continued over the top of the deposit prior to partial erosion. There are also some sphalerite-rich intervals within the copper zone, occurring as inward-directed extensions of the copper-zinc halo and as discrete zones, one of which, in the lake area, is spatially confined to the margin of a single intrusive phase. Sphalerite is present in veins and mantos in marble in the outer zone associated with wollastonite and green garnet skarn with lead and silver. 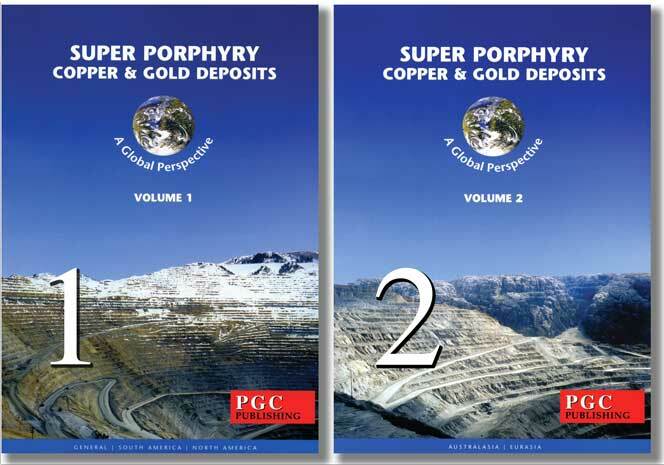 • Silver-rich mineralisation occurs in two populations. The first is within the copper zone which has consistent values of 7 to 8 g/t Ag, suggesting that the silver occurs as a solid solution in chalcopyrite. The second is in outer sections of the copper-zinc zone and the outer zone of veins and mantos within marble, where higher silver values are associated with galena, bismuth sulphosalts, proustite and late-stage tennantite in veinlets. • Molybdenite, which is present in quartz veinlets in the porphyry, in garnet endoskarn, and in exoskarn proximal to the porphyry intrusion. It is also abundant in the wollastonite skarn, where it tends to occur as coarse disseminated flakes. These skarn types generally contain >0.05% Mo, with local values of >0.1%. The remainder of the skarn contains <0.02% Mo. • Bismuth mineralisation, which attracts a smelter penalty, occurs in more significant levels (>15 ppm) on the northern and southern extremities of the deposit, where it forms an outer zone close to the limestone contact. These Bi-rich zones are dominantly in the green garnet and wollastonite skarns, but also in the brown garnet exoskam at the deposit extremities, and are mostly >100 ppm, but may reach thousands of ppm. In the upper levels, the outer bismuth zone tend to be wide (typically 200 m), but narrow at depth to as little as 10 m. Elsewhere in the deposit, irregular, patchy bismuth enrichment zones with 15 to 40 ppm Bi are interspersed with volumes containing <15 ppm Bi. The copper and copper-zinc ore zones are each divided into low and high bismuth types, with the bornite ore always contains high bismuth values. The most common bismuth minerals are bismuthinite (Bi2S3) and cosalite (Pb2Bi2S5), but wittichenite (Cu3BiS3), cuprobismutite (Cu10Bi12S2), aikinite (PbCuBiS3), kobellite (Pb22Cu4(Bi,Sb)30S69) and native bismuth also occur. These bismuth species are included within and intergrown with pyrite, sphalerite, chalcopyrite and bornite. • Bismuth mineralisation, in the form of galena, is present in the outer sections of the green garnet skarn, with grades of thousands of ppm Pb, and in the outer zone of veins and mantos in marble, associated with zinc and silver. • Elevated gold occurs in the outer copper-zinc-bismuth zone in the southern sections of the deposit, with grades averaging ~0.1 to 0.2 g/t Au. The most significant intersection to 2004 was 180 m @ 0.25, including 15.3 m @ 0.94 g/t Au and a maximum of 3.1 m @ 1.49 g/t Au. Gold is associated with the wollastonite skarn, although visible gold has only been rarely identified as small inclusions (max 10 µm) of native gold and electrum in chalcopyrite. 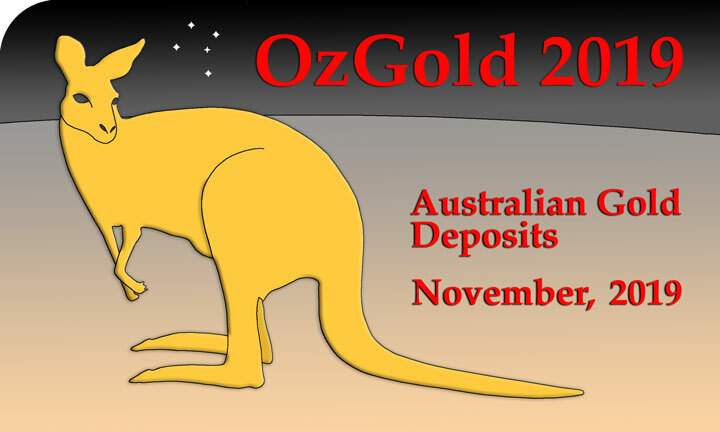 Elsewhere gold values are low, with isolated intervals of 0.1 to 0.2 g/t Au, with rare higher values, in the main skarn body at the northern end of the deposit in the chalcopyrite zone. 1.5 Gt which was open at depth on the limbs of the deposit. Measured + indicated + inferred resources, sulphide zinc - 0.288 Gt @ 0.95% Cu, 1.74% Zn, 16.4 g/t Ag, 0.01% Mo. Measured + indicated + inferred esources, sulphide zinc - 0.903 Gt @ 0.99% Cu, 1.68% Zn, 16 g/t Ag, 0.009% Mo. Note: Resources are inclusive of reserves. This summary is in part drawn from "Lozada, L. and Espinoza, J., 2011 - Technical Report Mineral Reserves and Resources, Antamina Deposit, Perú 2010; an NI 43-101 Technical Report prepared for Compañía Minera Antamina S.A., 86p." Love, D.A., Clark, A.H. and Glover, J.K., 2004 - The Lithographic, Stratigraphic, and Structural Setting of the Giant Antamina Copper-Zinc Skarn Deposit, Ancash, Peru: in Econ. Geol. v.99 pp. 887-916. 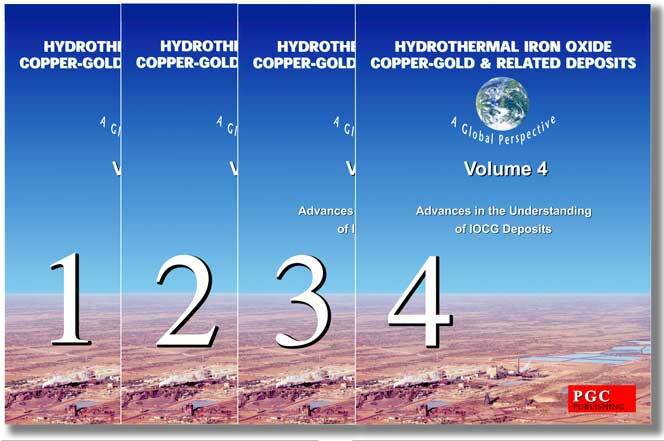 Lozada, L. and Espinoza, J., 2011 - Technical Report Mineral Reserves and Resources, Antamina Deposit, Peru, 2010; selected extracts,: in NI 43-101 Technical Report prepared for Compania Minera Antamina S.A., submitted to Toronto Stock Exchange ppI, 1-2, 11, 13-31.